Hi folks - New Year greetings and blessings to each and every one of you out there. It's 2012 - and this is my first blog entry for the year coming to you straight from the Republic Of Singapore. I would like to start the year by looking at some of the issues plaguing many of our local Singapore gyms and fitness centres nowadays. As most of you know, the fitness scene in Singapore has sort of EXPLODED in the last couple of years, and everywhere you turn, you could practically see gyms, fitness centres and exercise studios mushrooming across the nation. Unfortunately, this exponential growth in the gym business has also led to the propagation and valorization of gym training through rose-tinted lenses - while ignoring the beauty and effectiveness of other non-traditional fitness approaches - such as outdoor fitness training - that are equally, if not more, effective. To be honest, many of these folks promoting the GYM as a "Be All and End All" of fitness - do have vested interests and agendas in supporting their cause - people like gym owners, business partners in fitness centers, exercise equipment sellers etc - all whose livelihoods depend very much upon - and revolve around - the existence of gyms. So, seriously speaking, are gyms REALLY the place you should go to for your fitness shot??? Well, I leave you to make your own conclusion after reading the following. On behalf of my fellow fitness professionals and other fitness authorities out there who share similar views, I would like to discuss the gym scene from a very DIFFERENT and CONTRARIAN perspective. So here is what we really think are some of the issues that plague most gyms and fitness centers in Singapore. 1. Most Gyms Promote An Unhealthy Reliance On Artificial "Machines"
Walk into any gym or fitness centre in Singapore and you'll be faced with an astonishing array of gleaming, space-age equipment and machines that often flatter to deliver on their promises. Gym Machines - whether of the resistance-kind or the cardio-kind - have been around for decades, and have been increasing in variety and kind at an astounding rate. In fact, here in Singapore, there even seems to be a competition among rival gyms to see who could stock-up on the latest and newest machines faster than its next-door competitor!! Unfortunately, for most recreational exercisers and fitness enthusiasts, exercise machines are simply NOT the best exercise tool you would want in your quest for a better, fitter, firmer or more attractive body! Research in exercise science has repeatedly pointed out that that not only do most exercise machines FAIL to provide one with a realistic workout - workouts that actually replicate the exact movements and groove of the Human Body - worse, they often subject us to artificial, awkward or even unnatural movement patterns, angles and loads - which NEGATE much of our efforts in the gym, and lead to the NEGLECT of many of our important assisting and stabilizing muscle groups that are so vital for balanced, overall fitness development. And the end result of this over-reliance on machines? A body that is unbalanced, prone to injuries and lacking in real-world or functional fitness. In fact, in my personal opinion, most people would get far GREATER fitness benefits by moving their furniture around at home than working out on many of the newfangled exercise machines found in most gyms today! 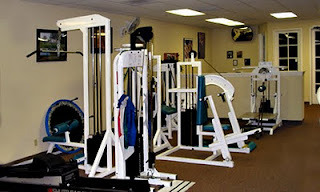 In a nutshell, over dependence on a "machine culture" in your fitness program (and yes, that includes the Treadmill as well the Smith Machine) will NOT contribute to your overall fitness development in the long run. On the other hand, the use of a variety of functional training tools ( think free weights, medicine balls, kettlebells, bands, ropes etc) and even your own body weight have far MORE merits than any machines out there. Walk into most gyms in Singapore and you'll invariably see people working on their 'arms, 'chest' 'legs' or 'abs' - individual and isolated body parts on our human body. In fact, most of the gym culture within Singapore still revolves predominantly around "body-part training" such that other forms of fitness training have been swept under the carpet to the detriment of most people's fitness! Isn't this IRONIC - considering that this is happening in an environment that is supposed to promote fitness??? Now, unless you're a serious body-builder, or someone rehabilitating an injured limb - isolated body-part training is simply NOT the way to go if you want to lose weight, burn fat or even build a toned, athletic, functional physique! Exercise science and sports research have proven that the BEST way to get in shape is to use Full-Body, Integrated Movements in our training regime that mimic what we do in daily life. For example, exercises like the Kettlebell Swing or the Medicine Ball Transverse Lunge are far more PRODUCTIVE and EFFECTIVE than your typical gym moves like the machine lateral raise or the machine leg extensions. Always bear in mind the cardinal rule of training: INTEGRATE, not isolate!!!! Tell me - when was the last time you see someone working on speed, agility, balance or even power development in the gym??? Yet, these are extremely important fitness components that make up TOTAL or COMPLETE fitness. Even then, it is still NOT a good enough reason for people to ignore the fundamentals that make up TOTAL fitness. Sometimes it is simply better to forget about the gym, and just take your fitness workouts outdoors where you will never be constrained by space and stereotypical norms, and where you can give equal focus to all aspects of your fitness. Think juice bars, lounge corners, massage chairs and even private Video/TV entertainment - and sometimes you really do wonder whether you're in a gym or at an exotic spa retreat. Simply put - these things have absolutely NO place in any gym - no matter how you justify it. Let's get this right, once and for all, a gym must be a place for you to WORKOUT, not chill out! Sadly, many gym owners actually think that by providing these amenities and other "top-flight" entertainment, they are providing value-added services to their members !! In my opinion, I think they are doing a great DISSERVICE to their members - fitness-wise. - How intense or serious can your workouts be if you have one eye on the TV screen???? - And how much calories can you burn if you're constantly lounging at the plush chairs and sofas flipping through newspapers and magazines??? - And finally, what's the point of working out and then putting ALL the calories back in one gulp when you consume one of those so-called "health drinks" at the juice bar??? Simply sad, but true. Many people are actually NEGATING their very efforts in the gyms by surrounding themselves with these "value-added amenities". Honestly, most folks would be far BETTER OFF working-out with minimal equipment in their basements, garages, home fitness corners or even at a secluded corner of a park - where distractions are few and far between. As mentioned in an earlier blog post, gyms and fitness centres DO have their place in our fitness culture - albeit for the small 10% of our population (such as serious bodybuilders and those rehabilitating from injuries) whose use of the gym justify their goals. Other than that, the rest of us may actually be much BETTER OFF pursuing our fitness goals - outside the context of a gym - in view of what has been discussed above.